Our purple raw smoothie in honor of the late, great Prince — who was also a dedicated vegan. 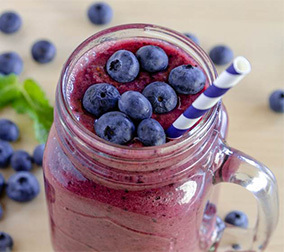 Packed with essential vitamins and nutrients, this Superfood smoothie will help you get fit and lean for the summer! Blend all ingredients in a blender and top with chopped banana, almonds and dried cranberries. Serve immediately.